Make sure your wires, cable, and control cabinets have durable, readable identification that lasts. LAPP's FLEXIMARK® cable and wire marking system can quickly and easily generate simple inscriptions, labels, or markings either manually or using FL-Soft Cable Marking Software. This highly versatile system comes in a variety of quality materials to accommodate both indoor and outdoor cable marking applications, including durable stainless steel for high-temperature and harsh environments. It is also simple to assemble, even in tight, hard-to-reach spaces. That means you can have quality, durable cable marking wherever you need it. LAPP offers a variety of perforated labels in many different styles to fit individual application requirements. We also have different styles of collars, such as transparent and halogen-free, which is perfect for use before mounting the wire. FLEXIMARK® Cable Marking Systems are available as separate items or as a convenient starter kit. Or, choose to create your own custom labels for on-site marking. 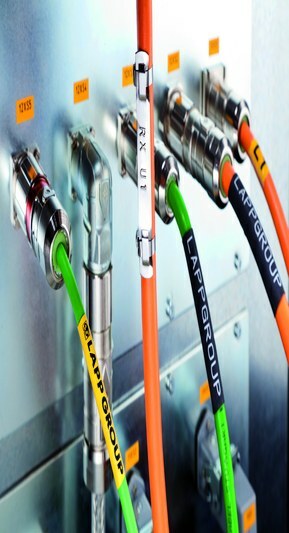 FL-Soft Cable Marking Software is especially suitable for data cable marking. Standard marking systems are ready-made for a quick delivery of high quality cable marking. Cable marking is custom-made for a quick and easy mounting on site. Our software allows you to design and print your cable marking on either a laser office printer or a thermal transfer printer.